The start of this issue has Barry joining up with the Justice League Dark to fight Solomon Grundy. Wait, Solomon Grundy? What’s HE doing here? Barry wonders the same thing, but there are no ready answers here. Barry ends the threat for now, and catches up to Iris and his own coworkers at Chyre’s Pub, where the bartender is…Commander Cold? Yes! After all, even a 25th Century Renegade has to eat, so he’s making extra cash here. 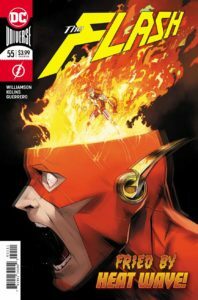 …while Barry has visions of a very strange and grotesque image of Wally while trying to go to the bathroom (wow, makes you worry about public bathrooms in Central City, right?). Barry gets called to Iron Heights, to a very strange sight – there was a sudden burst of intense heat that injured Mick, but no rouse detected. For Heat Wave’s part, Mick is having his own visions while in the infirmary…a burned out landscape where he meets a creature composed entirely of fire! …fire creatures attack Iron Heights! And as a major explosion happens, we see a gigantic version of Heat Wave, now taken over by the Sage Force! In some respects, this issue is sort of a bridge from one part of the overall story to the next, rather than a chapter filled with new developments (other than the last page). We start with an unexplained battle with Grundy and build up to the big reveal of the Sage Force-infused Heat Wave at the end. Not a problem – these kind of issues are needed to make a longer arc work. But, an issue like this will probably have some Easter Eggs that will make more sense when we look back a few issues from now. I love the code phrase Iris and Barry have for when he needs to go off as the Flash. Iris asks about his “old track team”, just as Lois and Clark have “Beef bourguignon with ketchup”. And frankly, I like Barry and Iris’ code phrase a lot more. After all, it’s easier to slip that phrase into conversation and have it make sense. Scott Kolins does a great job with the illustrations in this issue (but then again Kolins usually does a great job with any comics assignment). Luis Guerrero stays with the team for this issue with the color work, which on a FLASH comic is particularly important. I absolutely love the artwork here! SUMMARY: Another good script from Joshua Williamson, combined with great artwork by Kolins and Guerrero, makes for a solid issue. I’ll give this one a 8/10…but that’s just my opinion. What do YOU think? Leave your comments below!